I love cookie dough. When I was younger I would eat it from the bowl while baking… then I learned that you shouldn’t eat raw egg. That put an end to that, unless I was making a raw dough, which never tasted the same. All of the ingredients were different and just didn’t compare. Thank goodness for Cookie Doh Co. All of the hard work is done for you so you can enjoy without the effort and let’s face it… Mess! Cookie Doh Co. Has 5 delicious flavours including my favourite and an all time classic, Chocolate Chip! It tastes just like it should, without the ingredients that have the potential to make you sick. Bonus, it lasts longer too! Unless you eat it all at once that is ? 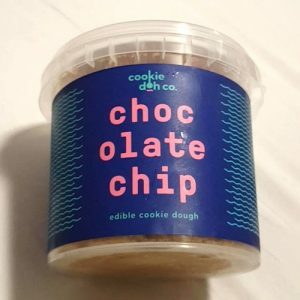 Cookie Doh Co. Is a Melbourne based company with an online store, creating yummy and edible raw cookie doughs. They’ve put the time and effort into the science and removed unnecessary ingredients such as rising agents and egg to create something that is 100% edible in its raw form. Because such ingredients have been removed, it allows the product to be shipped throughout Australia without the need for insulation as it has a 2 week shelf life when not refrigerated. It is recommended that you store in the fridge, this gives it a 4 weeks shelf Life. It also tastes so nice cold! Just sit it on the bench to warm up enough to scoop and you’re good to go. I will absolutely be repurchasing. It’s delish and I don’t have to make mess is the kitchen. Homemade just doesn’t taste as good in the case anyway! Check out www.cookiedohco.com for full details and to purchase.